Welcome. Our Colorado Notary Blog provides information about Colorado Notaries and other information in the following categories. You can choose a category below, or scroll down this blog index to select the desired blog post. Or, go to the blog posts page to browse at Colorado Notary Blog posts or use the search box in the top menu or on the blog posts page to search for a topic. Colorado Law, Colorado Notary Training, Colorado Springs Mobile Notary, Constitution, Court Cases, Federal Law, Foreign Language Documents, How to Articles, Legal Forms, Legal Terms, Notary History, Notary Information, Notary Laws, Notary Questions, Notary Terms. Blogging Tips, Holidays, Product Reviews, Security, Small Business Tips, Tech Tips, WordPress Tips. Notary Public or Public Notary? Disclaimer: The information on our Colorado Notary Blog and website is for informational and educational use only. Information and articles may become outdated. Information may not be suitable for your particular situation. It is not to be considered or used as legal advice. For legal advice, contact a licensed, competent attorney. We post questions and answers (Q&A) for questions that we receive from customers, students, and other sources. Your questions are welcome. Please submit your question by using the contact form under Contact Us. 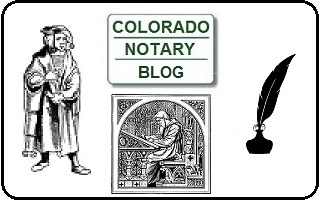 Thank you for visiting our Colorado Notary Blog. Go to Colorado Notary Blog posts. Call us for Colorado Springs mobile notary service or Colorado Notary Training classes. Visit our web pages for Colorado Springs Mobile Notary services or Colorado Notary Training classes.